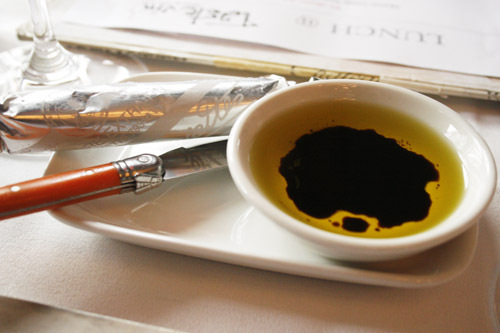 Alex brings us some Olive oil and French butter to spread on the delicious House-made bread. The Laguiole knife brings a very authentic French touch to the table. The little bee (or fly, the mystery remains intact on this matter) on the handle is indeed a very recognisable symbol the world over as a sign of quality and traditional craftsmanship. 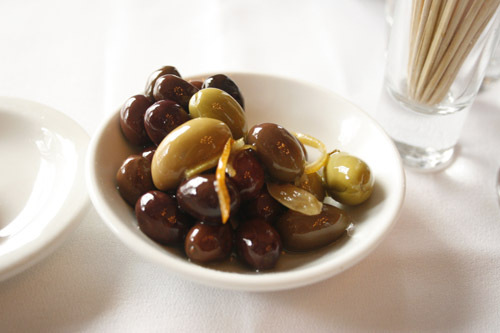 We also nibble on some marinated olives, which are very nice as well (I do like my olives). The entrées arrive and the Gnocchi are as good as I remember, except this time I have a whole dish to myself 🙂 The Mornay sauce is really creamy and cheesy, with a hint of truffle oil, which works a treat here . These Gnocchi are not the potato gnocchi we are used to, but made out of choux pastry: they are really soft and melting in the mouth! You can actually find the recipe on Gourmet Traveller’s website here. Two of us have chosen the Grilled eye fillet with pommes frites & Béarnaise sauce for the mains and we are not disappointed, both of them are cooked perfectly. 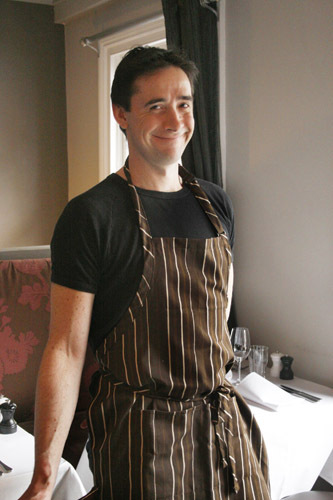 The béarnaise sauce is creamy and moreish and I wipe the dish clean. 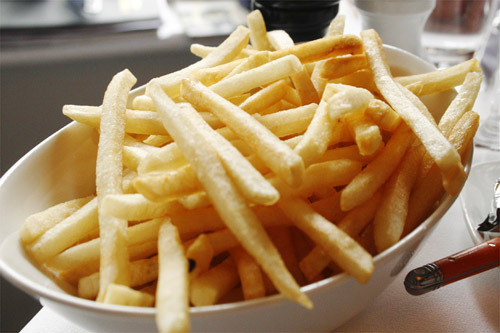 The accompanying fries are also nice and crunchy. N. is happy with his Cassoulet, the Duck leg is very tender and the saucisse toulousaine (hidden under the beans) is another lovely home-made creation. I know I would have chosen the Grand Marnier flambéed Crêpes Suzette with Vanilla bean ice-cream, to see how the pros do it (cf. my attempt a few months ago)… but it will have to wait until next time! 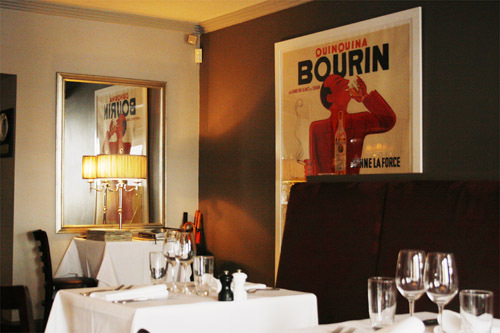 All in all, a very good value lunch, good food, good company, friendly service… what more can you ask for! PS: You can check out more customer reviews of Tastevin on this website: Customer Underground. 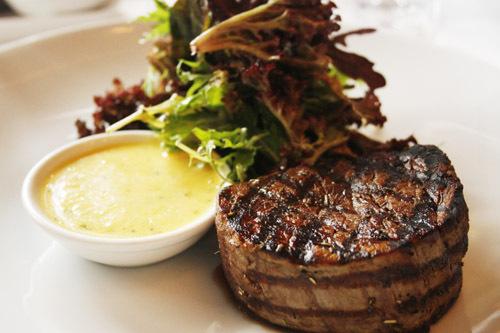 They featured my picture of the Eye Fillet to illustrate their page, yay! 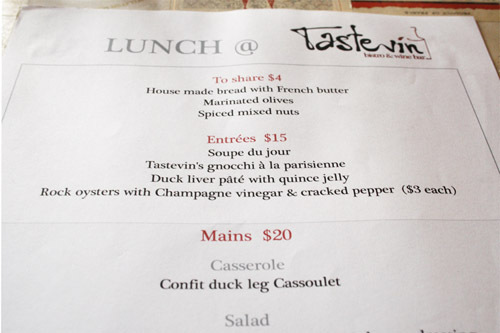 This entry was posted in Restaurants and tagged Bistro, Cassoulet, Darlinghurst, Duck Confit, French, Gnocchi, Tastevin. Bookmark the permalink. This place looks lovely. The prices are really reasonable too. 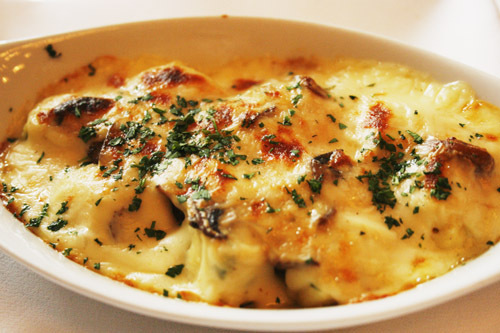 the gnocci in bearnaise sauce looks divine! 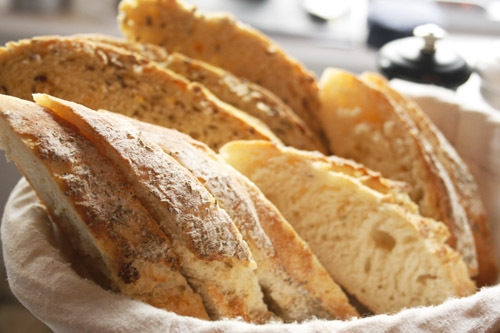 They are Tastevin’s signature dish for which people keep coming back (as well as their Sole meunière)! 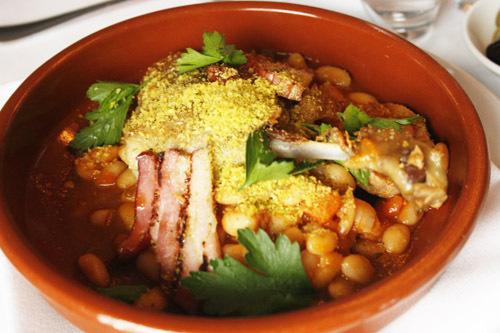 Mmm, nice place & couldn’t say no to the cassoulet. the steak looks great.. and comes with heaps of chips.. that, I like, Sandra! Indeed the steak was gooood! I like a good unpretentious French bistro! I haven’t been yet but it sounds like I would be hooked on coming back. Yep, Tastevin has indeed “un petit goût de revenez-y”! Sounds wonderful, I’ve just bookmarked this 🙂 Great pics too! Yum, yum, yum. Must try to get there. Oh my god Steak and frites with Bernaise sauce for $20 at lunch I am so there. Pity you didn’t have time for dessert as I would have loved to have known what you thought of the crepes suzette.